Poverty is in the air. Upright Five of Pentacles carries no surprise element. Its main highlight is suffering. Same is true for a relationship where security is at stake. But here one partner is suffering more than the other. This is shown by the crippled man in the card. He has a troubled leg, but is accompanied by his lady. This depicts the sickness in the relationship. It is not that his lady is not aware of the problem. She herself is experiencing it as shown by her torn clothes. For a relationship, it implies that the problems are not kept in veil, but at the same time they are not easy to solve due to the fact that they are more external than internal. But this is the case in husband and wife or any other committed relationship. Apparently, a man and woman connection that just goes in circle can also be represented by the Five of Pentacles. A commitment has not taken place. The dating is still going on. Otherwise, some kind of friends with benefits is in the air. No matter what it is, one thing is certain and that is, the emotional connection has turned too difficult to digest. 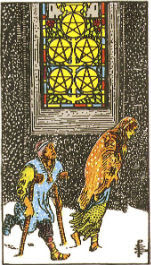 For feelings, Five of Pentacles depicts a situation where the love interest feels left out in the cold. He or she is being blocked from all the happiness. The tarot card can also form an imaginary scene for him about you, but again it is not a good one. In this case, he feels having a relationship with you might mean that you will not take care of him much and thus, he will suffer. In another scenario, it is possible for him to think that he is not good enough for you because he lacks the qualities that you want in a man. Overall, according to him, you will not be happy with him. In reversed position, Five of Pentacles says that the suffering is coming to an end. The security and happiness in the relationship are now beginning to resurface. But again, it is just the beginning of the new phase. So will power must be used to see the best positive outcome. For feelings also, reversed Five of Pentacles is a good tarot card to get. Here the meanings are slightly twisted. If you really have shown interest in your love interest then it implies that he is aware of it because he is getting the attention he needed from you. But in other cases, it simply heralds that he feels that you have the power to take him out of his miserable life.